The third edition of a bestseller, Human Safety and Risk Management: A Psychological Perspective incorporates a decade of new research and development to provide you with a comprehensive and contemporary guide to the psychology of risk and workplace safety. A major enhancement is reflected in the new subtitle for the book, A Psychological Perspective, which highlights both the expertise of the authors and also confirms the predominantly psychological orientation of the revised text. This book discusses how people perceive and manage risks and how to make the workplace a safer place. It examines the influence of individual factors on safety, as well as team and organizational factors at work, from a psychological perspective. It also highlights changes in safety due to the changing workplace, globalization, and managing employees’ safety and health beyond the workplace — a challenge that many organizations have yet to address. Reflecting current scientific research across a range of disciplines as it applies to human safety and risk management, this book helps you meet the challenges posed by the rapidly evolving workplace. Ian Glendon is in the School of Applied Psychology, Griffith University Gold Coast Campus, Queensland, Australia. His research interests include risk management, safety culture, occupational health and safety, personality and safe behavior, and driver behavior/driver stress. As well as co-authoring the previous two editions of Human safety and risk management, he has over 100 refereed publications and three other books, his work being extensively cited. He has supervised over two dozen research higher degree students and completed numerous research contracts. He has consulted for over 80 clients on topics including safety culture, accident/incident analysis, task analysis, human error/reliability analysis, and safety auditing. An elected Fellow of the International Association of Applied Psychology (IAAP), and of the Institution of Occupational Safety and Health, his other professional memberships include Chartered Occupational Psychologist (UK), and Chartered Ergonomist & Human Factors Specialist (UK). He is a former president of the IAAP Division of Traffic and Transportation Psychology. Sharon Clarke is Professor of Organizational Psychology at Manchester Business School, University of Manchester, UK. She gained a First Class BA degree in Psychology (Manchester, 1990) and PhD in Organizational Psychology (Manchester, 1993), before becoming a lecturer in Applied Psychology at Aston University, and later joined UMIST (now the University of Manchester) in 1996. She has research interests in safety culture, safety climate, leadership, personality, occupational stress, well-being and health. Her work has been widely published in leading academic and practitioner journals, national and international conferences, and co-authored and edited books. She has held a number of funded research grants, including from the Institute of Occupational Safety and Health, UK government grants and industry funding. She is currently Associate Editor for the Journal of Occupational and Organizational Psychology and the Journal of Occupational Health Psychology, and is on the Editorial Board of the International Journal of Stress Management. "Glendon and Clarke have done it again—a wonderfully contemporary update of their classic book on Human Safety and Risk Management, originally published in 1995. The past two decades have seen many new discoveries in the science of psychology, ergonomics and human factors which have been expertly captured in this new textbook Offering such a complete and joined-up analysis is refreshing and a definite strength of the work. The book really does have a completely new feel as it has benefitted from a full re-write by the two exceedingly well informed and renowned authors. This will be the new go-to book on Human Safety and Risk Management for both researchers and practitioners for many years to come. It is a new classic from a stable with an excellent pedigree." 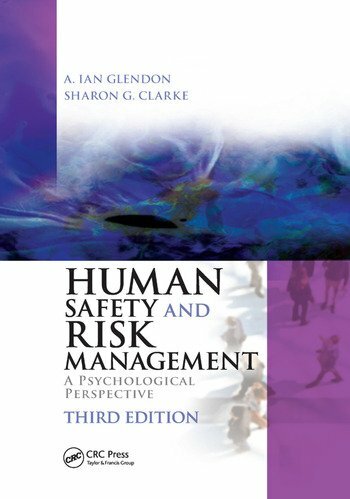 "Glendon and Clarke’s book offers a cutting edge holistic approach to the study of human safety and risk management. Although the goal of the text is to provide a psychological perspective, it does much more than that! By smoothly integrating the latest research from neuroscience, cognitive science, occupational health psychology, evolutionary science, and more, they advance transdisciplinary insights into how best to maximize human safety. Their multidisciplinary approach also allows the reader to gain a greater (and more accurate) appreciation of the myriad multilevel and contextual factors influencing human safety and the management of risk." "In this authoritative book, Glendon and Clark succeed in bringing together a vast array of knowledge on the psychological aspects of safety and risk, backed up by the latest research citations. This third edition, while retaining some material from the second edition, takes a ‘quantum leap’ in its greatly expanded content and its broad spectrum multi-level integrative approach. The integration of three key themes (neural substrate, evolution and organizational complexity) and their many components (some familiar, some less so) marks this book as unique in current reference texts on the complex area of human sense-making, reasoning and behaviour in relation to safety and risk."